Coconut! I am a devoted coconut lover. Coconut cake. Coconut cookies. Coconut ice cream. 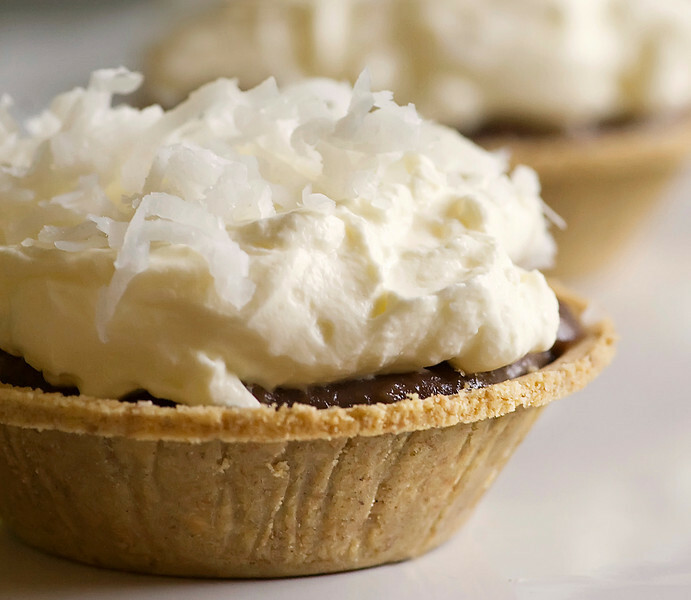 A few days ago I made individual chocolate coconut cream pies that will be appearing on this blog as soon as I sit down and write the post. I love ’em all. But coconut desserts are the easy part…what’s really exciting is finding a recipe that lets you incorporate coconut into the main course…now we’re talking! I’ve run into a few of these over the years, and they have a special place in my crazy conglomerate of a recipe collection. Coconut shrimp risotto, for example. Coconut fusilli. I even have a recipe for a coconut soup. But for a coconut lover like me, you can never have too many coconut recipes, so I was more than happy to add another one to my collection. The light sauce is a combo of sweet coconut milk with spicy chili sauce and tomato sauce, and the pasta gets tossed with this sauce, some scallions and bean sprouts and fresh basil and topped with…you guessed it, more coconut! And for dessert, I think I will have me a coconut ice cream sandwich. Because you know they are in my freezer! Meanwhile, in a large saucepan, over medium heat, combine the coconut milk, tomato paste, chili powder, salt, and chili paste or sauce (if using). Bring to a boil. Reduce heat and simmer for 2 to 3 minutes. Stir in the drained noodles and toss. Divide the noodles among individual bowls. Top with the scallions, sprouts, basil, and coconut. This looks perfect for a hot summer's night. I definitely want to bookmark this recipe! This looks awesome! I'm going to try it with rice noodles since we can't do wheat. Thanks for sharing it! You said 3 magic words. Spicy Coconut Noodles. I am trying these! Your spicy coconut pasta looks amazing. I love coconut in my savories. Thanks for your visit at my blog! I can't wait to try the recipes you've featured here…yummy!!! Wow that sounds delicious! My mouth is watering and I barely finished eating lunch. Perfect for this heatwave. Heck ya!!! There can never be enough coconut. This sounds delicious and my thighs thank you ever so much for introducing me to coconut ice cream sandwiches. Oh wow, just reading the ingredient list and I am salivating! This looks wonderful! I am not a huge coconut fan, but for some reason I love coconut milk all done up Thai style. This sounds fantastic! This sounded so good I bought the ingredients on my way home from work last night and made it for dinner. It was scrupmtious but…I think a full pound of fettucine (or rice noodles) is necessary. My noodles were swimming in sauce! Still a terrific idea and got me brainstorming about Sriracha sauce and coconut milk. Thanks! I'm a huge coconut fan too! This sounds awesome! Yay for main meals featuring coconut! Big fan. I am a recent coconut lover and can't get enough coconut recipes. My kids are following in my footsteps, and this looks like a family winner. Love your title photo! Just wanted to add that the recipe calls for bean sprouts while in the picture there are alfalfa sprouts. Sure either would be fine, although I would have preferred alfalfa. About to cook now, can’t wait to try!